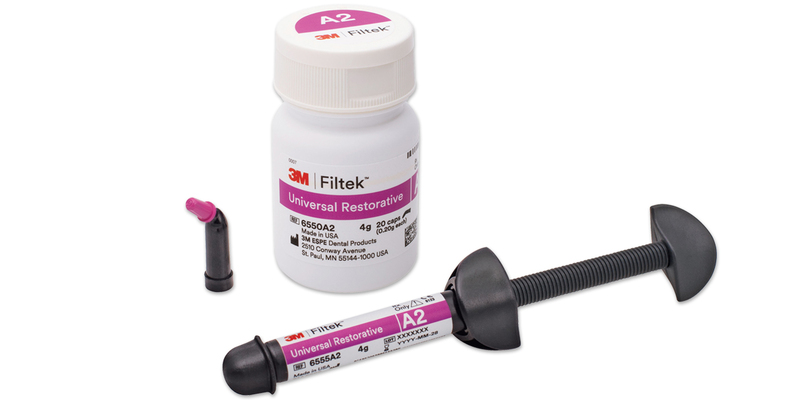 2 Filtek Restorative capsule dispensers FREE! Visible-light activated restorative composite, optimized to create esthetic anterior and posterior restorations. The simplified shades have a body-like opacity, enabling up to a 2mm depth of cure. The pink opaquer (PO) shade can be used to mask discolored or stained tooth structure, metal discolorations and amalgam stains and can be placed in 1mm increments. Simplified shade selection – just 8 shades and extra white cover all Vita shades. Universal opacity to blend more naturally. Fluorescent pigments to give restorations a lifelike appearance. 3M’s nanotechnology for easy polish that lasts. Low-stress monomers for fracture resistance. Increased radiopacity for easier identification at recall. Contains: 10 x 0.2g capsules. Contains: 90 x 0.2g capsules (20 ea. shade A1, A2, A3, A3.5 and 10 PO), technique guide, instructions for use. Contains: 5 x 4g syringes (1 each shade A1, A2, A3, A3.5, PO), technique guide, instructions for use.